One of the strongest materials in the world is Pearlite or Pearlitic steel, which can be made into thin and long wires. Pearlite’s strength enables it to endure very heavy weight; however, its potential to stretch and contract without breaking, or ductility, makes it unique. Ductility is vital for constructing bridges because despite being strong enough to bear heavy weight, a material which is not ductile enough can break when subjected to stretching. This is the reason which causes structures made of concrete to still collapse at the time of violent earthquakes. Pearlite is used for suspension bridges to assist them in resisting strong shaking while sustaining heavy weight. Pearlite is composed of nanolayers of ferrite and cementite which are arranged alternatingly. The cementite offers it strength, while the ferrite offers it ductility. However, to date, scientists were not exactly aware of how both elements worked together to give pearlite its unique quality, or in better words, how to control their working together to create even better material. 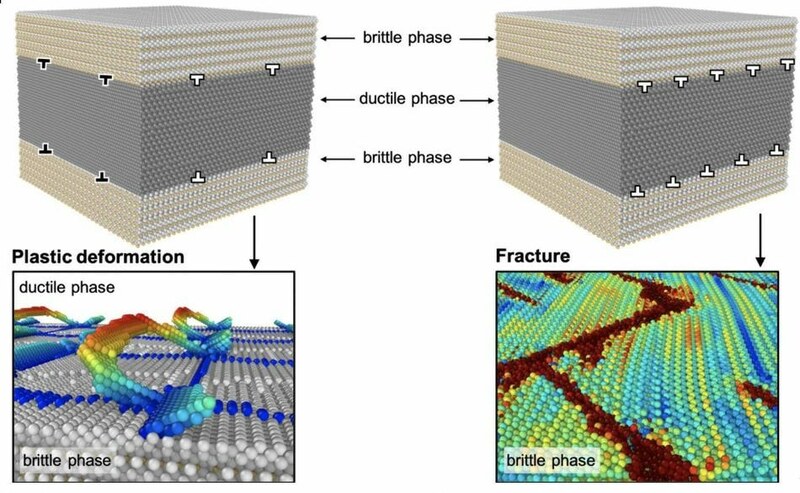 Scientists from Kanazawa University have found out that dislocations, or disruptions, in the organization of atoms along the interface between a ferrite and a cementite layer prevent the cementite from breaking under compression or stretching. Their work was reported in the Acta Materialia journal in December 2018. The scientists used computer simulations to observe the deformation of a pearlite wire with dislocations of various orientations and distances between them along the interface of ferrite-cementite. They discovered that specific dislocation structures and distances could prevent cracks from forming or spreading through the entire cementite layer. “Increasing the ductility of pearlite means it can resist more shearing stress without breaking or tearing,” say the authors. This may result in a new class of materials for building bridges and structures that can endure stronger earthquakes. The scientists assume that the manipulation of dislocations comprising whole clusters of atoms could be a common technique for improving ductility as well as other properties of the materials to satisfy specific engineering and construction demands.